Although Apollonius of Rhodes' extraordinary epic poem on the Argonauts' quest for the Golden Fleece has begun to get the attention it deserves, it still is not well known to many readers and scholars. This book explores the poem's relation to the conditions of its writing in third century BCE Alexandria, where a multicultural environment transformed the Greeks' understanding of themselves and the world. 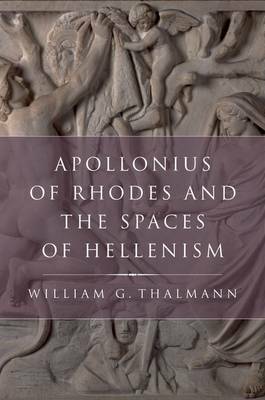 Apollonius uses the resources of the imagination - the myth of the Argonauts' voyage and their encounters with other peoples - to probe the expanded possibilities and the anxieties opened up when definitions of Hellenism and boundaries between Greeks and others were exposed to question. Central to this concern with definitions is the poem's representation of space. Thalmann uses spatial theories from cultural geography and anthropology to argue that the Argo's itinerary defines space from a Greek perspective that is at the same time qualified. Its limits are exposed, and the signs with which the Argonauts mark space by their passage preserve the stories of their complex interactions with non-Greeks. The book closely considers many episodes in the narrative with regard to the Argonauts' redefinition of space and the implications of their actions for the Greeks' situation in Egypt, and it ends by considering Alexandria itself as a space that accommodated both Greek and Egyptian cultures.